Richmond Elementary School Librarian Beth Redford discusses 'El Deafo' with a group of fourth graders. Graphic novels are really popular among fourth graders. 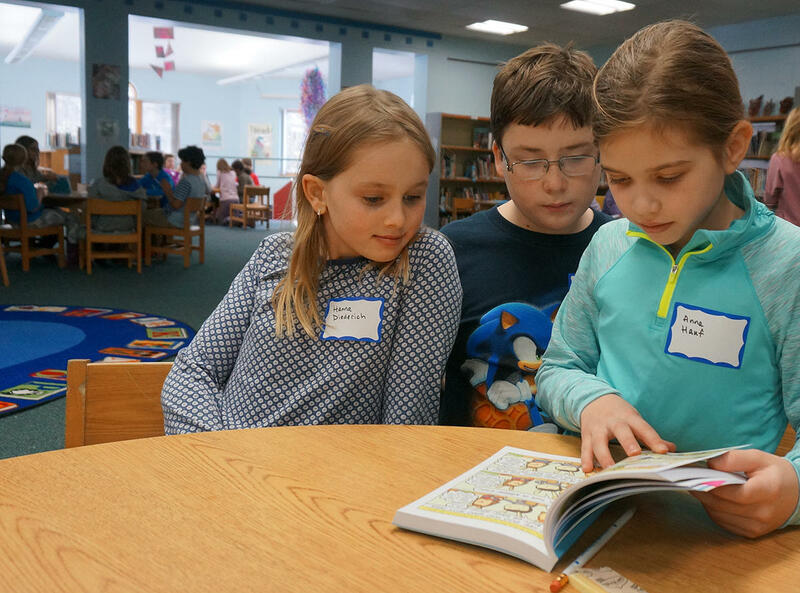 But El Deafo is the first graphic memoir that many of these Richmond Elementary students have read, and they were instantly engaged. Bell was four years old when she became deaf. El Deafo tells the story of how she learned new ways to interact with the world around her. And it also gives readers some insight into the best ways to interact with people who, like Bell, rely on lip reading to communicate. Cece Bell: Well, the truth is I have been deaf for a long time – for 40 years. And so, I’m actually very much used to it. I wear hearing aids, so most of the time when people speak, there is sound, because I can hear them because of my hearing aids. But, if you think about watching television without the volume and you look at the people and you see their mouths move, that’s sort of what it looks like. And there’s a little bit of what I like to call phantom voices. You get so used to hearing people that when you can’t hear them, you can almost imagine yourself hearing them. It’s a very strange sensation but one that I’m very much used to. And it’s really not that bad. It’s just the way it is for me. 'El Deafo' is a superhero-sized hit with these readers in Richmond. Bell was born able to hear, but she lost her hearing when she got meningitis as a four-year- old. This is interested fourth grader Grace Wolaver, who asked the author how she got sick. Cece Bell: My dad is a doctor. And he kind of thinks he might have had something on his hands, some germ or something that he simply passed on to me. And I discourage him from thinking that because it makes him feel bad ... That’s one possibility, but the truth is people pick up germs everywhere, all the time, and this was just one of those unfortunate coincidences for my parents. But who knows how I got sick. When it comes time for Cece to start kindergarten, she goes to a school for deaf children. She has a teacher named Dorn who teaches her how to lip read. But when her family moves, Cece has to be in a classroom with students who can hear. Cece's mom tells her that means she’ll need to get a new hearing aid, too. The new hearing aid is bigger and more powerful than the small hearing aid she uses at home, and it's called the Phonic Ear. The Phonic Ear that Cece wears at school is synced with a microphone the teacher wears like a necklace. Every day, Cece has to walk to the front of the class and give the teacher the microphone. And that makes her feel embarrassed. That led Richmond fourth grader Ronan Pichette to ask, "How does it feel when you walk in the door and everyone is staring at you because you’re different?" Cece Bell: I would imagine that everybody in the whole world has had this experience. Maybe you’ve come to school and your shirt’s on inside out. Or maybe ... you’ve got leaves in your hair and everybody looks at you. So I think we know that it’s a little bit on the embarrassing side. And for me, it made me feel very, very hot and sweaty underneath my clothes – not a good sensation. For me it felt like every day kids were looking at me, especially when I first moved to the Salem, Virginia area, where I grew up. I was the new kid in this new school, and the kids just weren’t used to me yet. It got old real fast. But I think everyone knows what that feels like. It’s not the best feeling in the world. The phonic ear makes Cece stand out, but it also gives her the ability to do things her classmates can’t, like hear what her teacher is up to in the teacher’s lounge and even the bathroom! It’s like having a superpower, and she secretly thinks up a superhero name for herself: El Deafo. Richmond fourth grader Illyanna Foran says her favorite part of the book is when Cece hears her teacher flush the toilet. Illyanna's classmate Abby Elder likes the part when Cece has her first crush. Both students want to know what part of El Deafo the author likes best. Cece Bell: My favorite part of the book, especially when I was working on it, was all the stuff about my first crush on a boy, Mike Miller. And I really enjoyed depicting myself as this ... pre-teen with all these hearts coming out of my head and following this boy around like he was the most beautiful creature on earth. That was easily my favorite part. I laughed out loud, sometimes, just remembering some of the dumb things I did just trying to impress this boy. 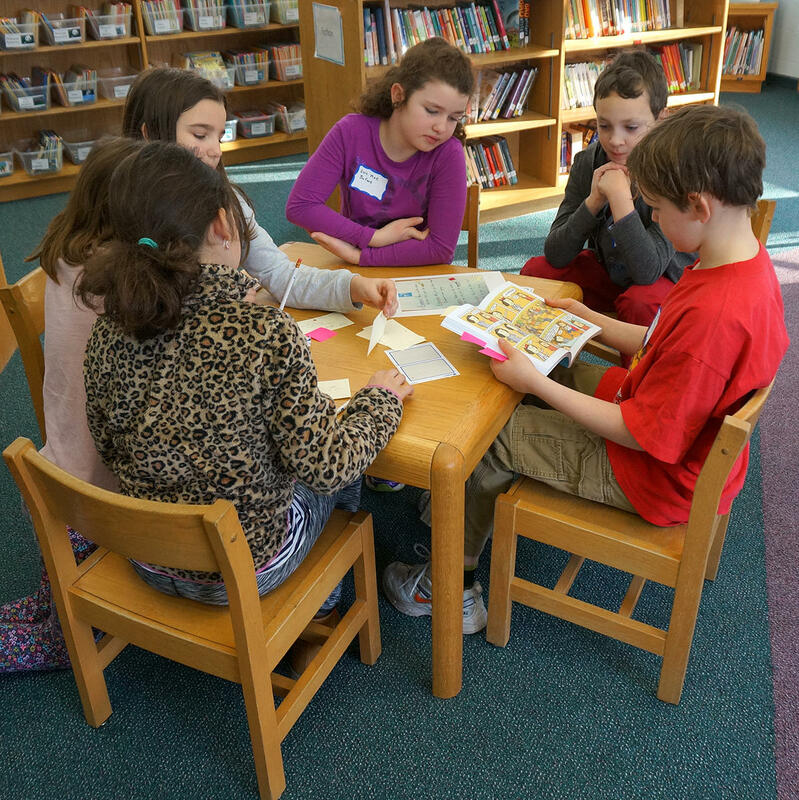 Richmond Elementary fourth graders brake up into small groups to discuss their favorite parts of the book. Richmond fourth grader Anna Hauf asks, " How did you come up with the idea to write a book about what happened to you?" Cece Bell: I had been putting off this story for a long time ... I had been telling a lot of the stories that are featured in the book ... over the years, and I always got people laughing ... I knew it was a good story. And then later, I happened to read Raina Telgemeier’s book Smile, which is a beloved graphic novel for kids. And once I saw that I realized that the graphic novel format was perfect for my personal story. And I think I was just waiting for the right format to come along. All the characters in El Deafo are depicted as rabbits. Richmond fourth grader Miller Hintz is curious about that choice. He asks, "Why did you pick animals instead of humans in your book?" Cece Bell: The reason for that, is that rabbits have very, very big ears and they can hear really well. I and I was trying to ... create this visual metaphor of being the only rabbit, in an entire school of rabbits, whose giant ears were there and visible, but they did not work. They were broken. And it was ... effective to have the ears really long and on top of my head because the cords that were connected to my hearing aid that went more to the sides of my head, in real life, to my ears. In the book those cords went all the way up over my head and are very, very visible. Which is closer to how I felt. I felt very conspicuous and like everyone was looking at me. So that kind-of fit really well. And also, bunnies are cute. And you can’t go wrong with bunny rabbits! In El Deafo, some of Cece’s friends treat her differently. One friend talks very slowly and shouts when she speaks with her. Another bosses Cece around all the time. Fourth grader Lucy Cabrera wants to know, "Are all the characters in the book based on real people?" Cece Bell: Absolutely. Sometimes I kept the character’s names and sometimes I changed them ... Basically, if I was unfair to one of the people in the story, their name got changed and if I was nice to them, I kept their name. So that’s sort of the code, you can tell who’s who. But there’s a few times when one character is actually sort of a composite – a few different people. Because I didn’t want make the story too confusing. The more people I put in the mix, the harder it would be to understand. So, everybody in the book is true. There’s just a couple of characters who were sort of a mash-up. But they represent real people. 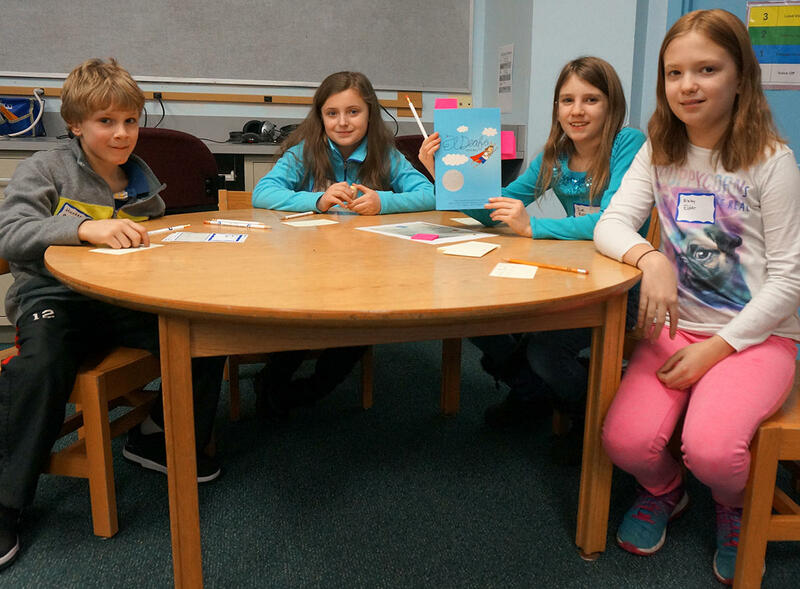 Cece Bell's graphic memoir is a big hit with these fourth graders in Richmond. Fourth grader Aleigha Pratt asks, "How does it feel to share your differences?" Cece Bell: The one-word answer to that question is: scary. I was very, very scared to put this book out into the world. I just did not know what the reception would be, and I was also really worried about how other deaf people ... would experience it when they read it. Would they be offended? Would I possibly cross a line because ... my experience of deafness is not the next person experience of deafness? While sharing one’s differences can be hard, sometimes there are great rewards. And for author Cece Bell those rewards have included high literary honors for El Deafo, including a Newbery Honor, an Eisner Award and a nomination for Vermont’s Dorothy Canfield Fisher Award.